The latest version of the ROMS/TOMS svn repository, revision 166, was frozen and tagged as ROMS 3.1. This version is quite stable. Then, the trunk was updated with the newest version of the code that includes the nesting and ESMF infrastructure. This version will be referred as ROMS/TOMS 3.2 in the future. The update is incremental due to the complexity of multi-grid nesting. However, a lot of files were modified as explained below. We already have a nesting prototype working but it still needs work. However, nesting is not available yet. We will let know when you can use nesting. There are still more changes to come. Many thanks to John Warner for his help in developing and testing this capability. This version also includes the ESMF drivers for ROMS. Many thanks to the ESMF group (Cecelia Deluca, Gerhard Theurich, and collaborators) for their help. This version works with any ESMF library, version 3.x or higher. More changes are planned for the multi-model coupling. We are now working on the interpolation routines and waiting for ESMF to allow curvilinear grids remaping. 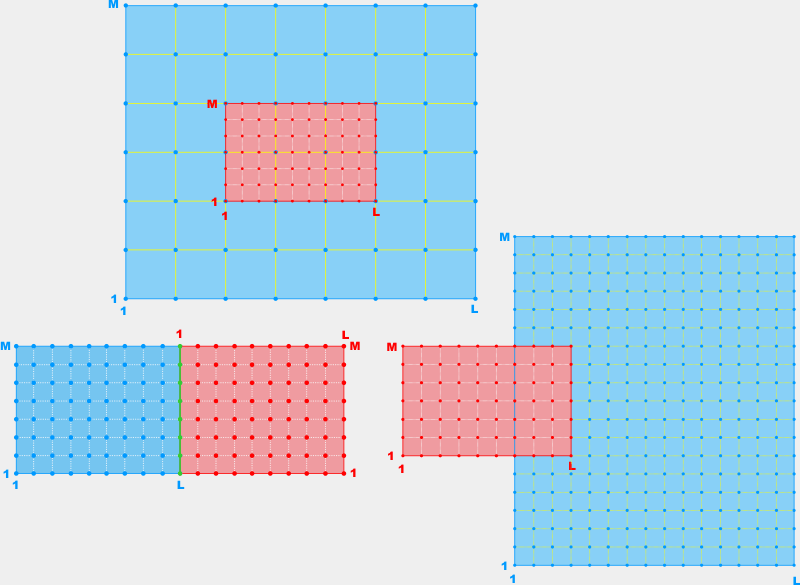 As shown below, three types of multiple grid nesting are possible in ROMS: refined (top diagram), mosaic (lower left diagram), and composite (lower right diagram) grids. The details of the connectivity between grids are shown and discussed in WikiROMS. The contact area strategy is similar to that used in periodic boundary conditions. The computational stencil is expanded to evaluate the horizontal fluxes at the contact boundary points which are needed to evaluate the state variables at the boundary correctly. Only the state variables are interpolated at the contact areas. The secondary variables are computed using the new IstrT, IendT, JstrT, and JendT indices. For example, the potential temperature and sality is interpolated between grids in the contact areas but not the density. The density is computed from the interpolants in rho_eos.F over the extended horizontal ranges. The -1 array element is the value for the global grid and the rest are the values for each tile (0:Ntiles). These values are assigned in routines get_bounds, get_tile, and var_bounds. All these routines can be found in file get_bounds.F. The indices IstrT, IendT, JstrT, JendT are used during nesting applications and include the overlap contact points between refined, mosaic, or composite grids. If not nesting, they are set to the same values as IstrR, IendR, JstrR, JendR, respectively. This includes all the analytical routines in the Functionals directory. You need to modify your customized routines in your applications to follow the new arguments. If you are not sure what to do, please check the changes to that routine in the changset list in trac and chick the (view diffs) link. The old code is in the left panel and the new code is the right panel. (*) The initialize, run, and finalize routines are renamed in all drivers to ROMS_initialize, ROMS_run, and ROMS_finalize, respectively. This allows a differentiation between models when using the ESMF library. The routine ROMS_run has now two arguments Tstr and Tend indicating the number of time-steps to perform. This will be used for squential or concurrent coupling. (*) An ESMF driver (Master/esmf_coupler.F) was added to couple ROMS to other models. This driver uses the ESMF super-structure to control the flow of information between all models. However, volumetric coupling between ROMS and other models is very hard, if impossible, within the super-structure. We interacted with the ESMF developers group about this weakness in the ESMF library. Although, we understand why the super-structure was designed to allow old legacy codes, time clocks, and parallel synchronization points. Then, Gerhard Theurich developed the direct coupling capabilities within the ESMF library. This is available in ESMF library version 3.1.0p or higher. This implies that is possible to call the ESMF library inside ROMS (say, main3d.F) to allow volumetric coupling and avoid splitting ROMS into different phases because of the super-structure. This also facilitates ESMF usage in the adjoint-based algorithms in the future. This is only possible because the coarse-grained parallelization of ROMS. All the parallel synchronization points are located in main2d/main3d. The structure of this algorithm is generic and very minimal, if none, changes are needed to import and export fields within ROMS. There is an additional module which declares all the new variables and structures needed for coupling. See file Modules/mod_coupler.F. The metadata for the export and import fields is specified in file External/coupling.dat. My next task is to unify the coupling between ESMF and MCT libraries. We plan to support both. Therefore, more changes are coming in your way.